Banten Province was the home of some Chinese People. No wonder, there are reminiscences of Chinese Culture in this region. Tangerang City holds some of them. When it is about temples, local people are familiar with Boen Tek Bio. Another name is Padumuttara Temple. 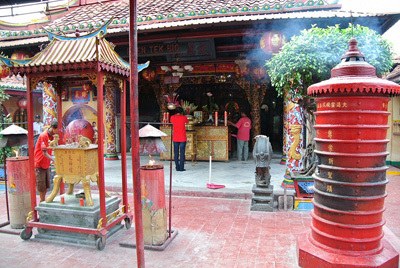 Tourists recognize it as the oldest temple in Tangerang City. The location is in Bakti Street 14 and it belongs to Sukasari Village, Tangerang City. People come to this site either for praying or a vacation. What is inside? It is a little bit complicated in describing the temple. In the yard, there are two small pagodas. In the midst of these items, you can find an outdoor prayer site. During special days, you may see people praying in this spot. Next, it is about the ornament. The temple features many types of beautiful ornaments such as statues, lanterns, and a gate. On the roof the building, you can see small dragon ornaments. Their color is green and their shape is quite mesmerizing. There is even a drum inside the temple. At noon, the temple has a few visitors. It is because of the heat of the sun. Most of the tourists would likely to visit it either in the morning or afternoon. They come to Padumuttara Temple for giving a prayer and exploring this building. It is actually the part of an old settlement in Tangerang. Many Chinese people lived in this area back then, especially in the 16th and 17th era. The thing is local people usually call it Boen Tek Bio. Why is the name? Boen means “literature” and Tek means “goodness”. What about Bio? It means “a big praying location”. These days, people call it Padumuttara Temple. Apart from praying, visitors would love to learn a little bit about the history of this place. The locals may tell you some of the stories of it. For example, it is the builder. The temple was built in 1771 AC by a Chinese landlord. Later, he gave the temple to the locals. The building procedure was done by numerous men coming from China. No wonder, the shape, and style of the building are flawless and beautiful. Before 1772, it was only a small house. Today, it becomes one of the most important temples in Banten Province. People use it to worship several gods including Kwam Im Goddess, Hok Tek Cen Sin, Kha Lam Ya and Kwan Seng Tee Kun. There was a renewal back then. These statues were moved to other locations during the renovation. Later, they were brought back to the temple. It is situated in Bakti Street 14. For those who come from Jakarta, the first destination is Banten Province. Next, you must head to Tangerang City and use Merak-Jakarta Freeway. The whole trip takes about an hour and the distance is 35 km. If you look for an accommodation, there are some nearby hotels. The price is different, though.